Parchment_Recycled_Paper__Cardstock is rated 4.8 out of 5 by 10. Rated 5 out of 5 by DeeDee2018 from Perfect card stock for formal announcement I purchases this brown parchment paper/card stock a little over a week ago to print and mail out marriage/elopement announcements. It was perfect for what we needed and wanted to do. Rated 5 out of 5 by CGSI from Well done Shipped immediately. Packed well.Exactly as ordered. Rated 5 out of 5 by LPBakery from Great Notecard Stock! We use this for our notecards that go in our gift boxes! We love the quality! Rated 5 out of 5 by junebug38 from Just the right color My purchase was to be the cover of a booklet of church history that I put together featuring the 155th anniversary of our church (founded in 1859) It was expensive but just the right color with our gold and white theme during the event. I received the paper with $7.07 due in postage after I had paid $15.71 postage at the time of purchase - so that was a shock. I "messaged" with your site and the lady was very considerate and you chose to refund my postage charges. Thank you so much for that. I have been using southworth paper. Is your parchment paper the same texture ? Can I get a sample of one sheet of blue ? Hi Tony. We do believe our parchment paper is the same texture (if not very similar). Here is the blue parchment paper: http://www.jampaper.com/ecom/index.asp/show/detail/cat/53/prd/171/c/39/s/34. To request a sample, click the button that says &quot;Request Paper Sample for Color&quot; at the right-hand side of your screen. Thanks! Please let us know if you have any other questions. It depends on which paper you choose. You can choose between the 24 lb. paper or the 65 lb. cover stock. The 24 lb. paper is standard text/letter paper and is .12 millimeters thick. The 65 lb cover is .198 millimeters thick and is typically used for business cards, greeting cards, post cards, etc. Please let us know if you have any more questions. Hi, I am wondering if this paper is the same front and back? Thanks in advance! Yes, both sides are the same front and back! Thanks for the question! Do you have 11x17 in parchment paper weight 65 lbs. Do you have 6 x 9 parchment envelopes to go with your 8 1/2 x 11 paper? &nbsp;We would like to have the &quot;Natural&quot; color. &nbsp;We would like to have 100 pages of the paper and envelopes. Absolutely! http://www.jampaper.com/Envelopes/ParchmentRecycledEnvelopesPaper. Be sure to click the A10 (6 x 9.5&quot;) option. Either complete your order online or call us at 1-800-801-0526. Thanks! I wanted to get note cards with 4 bar envelopes in orchid Map is that possible? What is the thickness of this paper? Yes, this paper will be compatible with a standard inkjet printer. Let us know if you have any more questions! This paper is perfect for weddings, announcements, greetings and everything in between. So when you want your recipients, clients, or soon to be guests to be excited about those letters, promotional mail, or invitations, choose right by choosing this natural looking Parchment! Parchment Recycled Paper & Cardstock are made from 30% post consumer recycled fiber, this way you help the environment and stay classy at the same exact time - what a combination! Parchment paper & cardstock measures in at 8 1/2 x 11 or 8 1/2 x 14 inches. 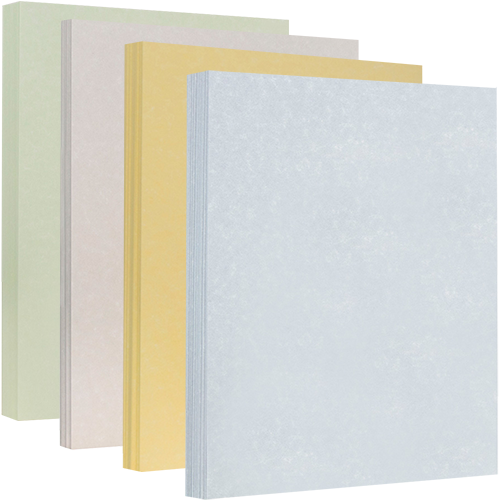 This paper is available in 9 beautiful colors: Brown Parchment, Antique Gold Parchment, White Parchment, Natural Parchment, Pewter Parchment, Green Parchment, Pink Ice Parchment, Blue Parchment, & Orchid Parchment.